UPDATE July 28, 2016: Vistaprint ends up winning .WEBS because .WEBS was only in direct contention with Web.com's application for .WEB. Vistaprint prevailed at the "last resort auction" on July 27-28, 2016, because Web.com dropped out of the bidding for .WEB "causing the Application of Vistaprint Limited (for .WEBS) to be deemed a Winning Application" said ICANN. See: New gTLD dot WEB 'Last Resort' ICANN Auction: and the Winner Is? 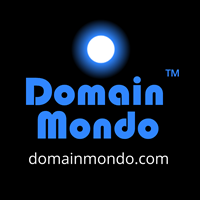 | DomainMondo.com. UPDATE: ICANN Board Resolution 03 Mar 2016: "Resolved (2016.03.03.02), the Board concludes that the Vistaprint SCO Expert Determination is not sufficiently "inconsistent" or "unreasonable" such that the underlying objection proceedings resulting in the Expert Determination warrants re-evaluation." UPDATE 2 December 2015: ICANN: "Resolved (2015.12.02.05), the Board defers to a subsequent meeting its consideration of the Panel recommendation in the Final Declaration that the Board exercise its judgment on the question of whether an additional review is appropriate to re-evaluate the Expert Determination. All members of the Board present voted in favor of Resolution 2015.12.02.05. One member of the Board abstained. Three members of the Board were unavailable to vote on the Resolution. The Resolution carried." Resolved, the board accepts the panel's recommendation that ICANN's board exercise its judgment on the question of whether an additional review mechanism is appropriate to re-evaluate the third expert's determination in the Vistaprint SCO, in view of ICANN's bylaws concerning core values and non-discriminatory treatment, and based on the particular circumstances and developments noted in this declaration including, one, the Vistaprint sco determination involving Vistaprint's .webs applications; two, the board's and ngpc's resolutions on singular and plural gtlds; and, three, the board's decisions to delegate numerous other singular/plural versions of the same gtld strings. Final declaration, page 70. The board will consider this recommendation at its next scheduled meeting to the extent it is feasible. The recommendation in paragraph (3) of the Final Declaration is not binding on the ICANN Board, however it may merit consideration due to the lengthy record of this case and due to the "particular circumstances and developments noted in this Declaration." The documented inconsistencies (pdf) in delegation of numerous other singular/plural versions of the same gTLD strings, are indicative of the many problems with ICANN's new gTLDs. Most people acknowledge that the ICANN new gTLDs policy, program, and implementation have been, in sum, a "fiasco"--even ICANN insiders who are honest admit this--see, e.g., on Domain Mondo: ICANN Insiders On New gTLDs: Mistakes, Fiascos, Horrible Implementation. Anybody want to talk about dot GAY (pdf)? The full Vistaprint IRP final declaration may be read here (pdf). 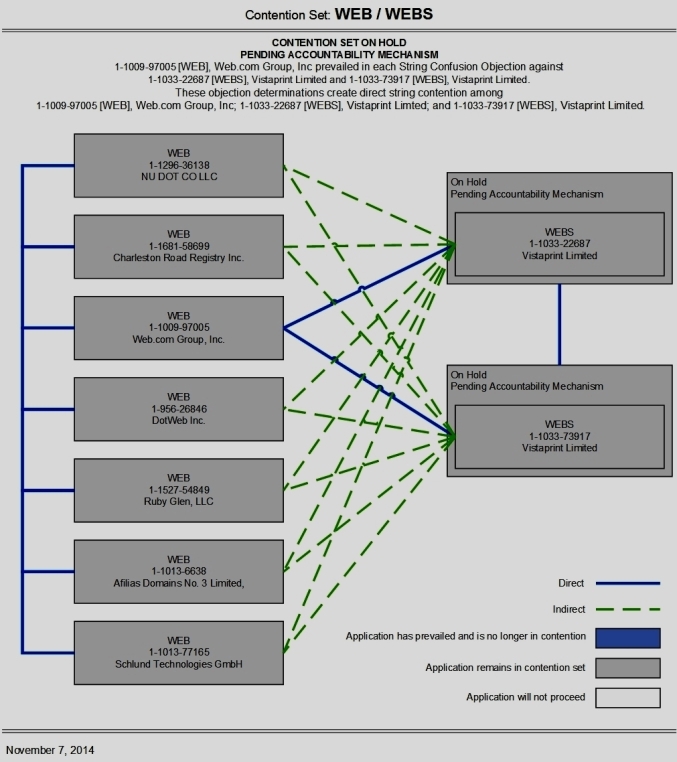 More information: Vistaprint Limited v. ICANN (documents from the Independent Review Proceeding filed in accordance with Article IV, section 3 of the ICANN Bylaws). Many observers (including Domain Mondo) think the .WEB new gTLD auction will likely bring the highest price among all new gTLDs--Google (Charleston Road Registry Inc.) is one of the 7 applicants for .WEB. If Google is serious about acquiring .WEB, expect to see an ICANN last resort auction, since Google would unlikely agree to a private auction which would only encourage other applicants to drive up the price* in order to "make Google pay the highest price" (in private auctions the "net proceeds" are split among the losing bidders unlike "ICANN last resort auctions" where ICANN receives the net proceeds [update] to be held in escrow for public beneficent purposes). *You can read about one unfortunate here: ICANN New gTLD Private Auctions, 2015 Patsy of the Year Nominees?